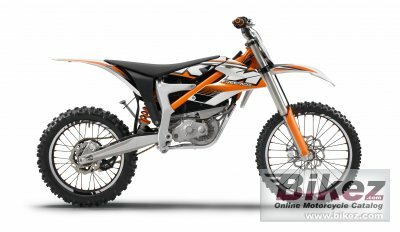 2012 KTM Freeride E. Picture credits - KTM. Submit more pictures. It�s time for a new offroad motorcycle segment! It�s time for more motorcycle freedom! It�s time for the Freeride E! With the revolutionary Freeride E, KTM takes lightweight, noise-free and agile offroad motorcycles where enduro riding was previously impossible: into the city! With 42 Nm of torque, up to 22 kW (30 hp) peak power and uninterrupted acceleration, it�s just as sporty as other KTM bikes. Engine details: Permanent magnet synchronous motor in a disc armature design. Frame type: Perimeter steel-aluminium composite frame. High-strength polymide / ABS plastic subframe. Comments: Traction battery: Lithium-ion (easily removed). Rated voltage: 300 V. Charging time: 1.5 h.
Ask questions Join the 12 KTM Freeride E discussion group or the general KTM discussion group. Click here to sell a used 2012 KTM Freeride E or advertise any other MC for sale. You can list all available KTM Freeride E bikes and also sign up for e-mail notification when such motorcycles are advertised in the future. Ads with or without pictures are easy to create. Our classifieds are completely free with sections for every country in the world. You can also check out our list of related motorbikes. Compare technical data. Look at photos. View your fellow riders' rating of the bike's reliability, design, engine performance, accident risk, repair cost, etc.